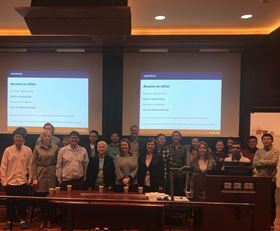 On Tuesday 27 November, Harvard School of Engineering and Applied Sciences hosted a workshop and panel discussion with Materials Today Publishers and Editors. The session covered the publishing landscape, including the varied roles of Authors, Editors, Referees, and Publishers in connecting communities, research trends from a publishing perspective and the launch of three new journals. Journal selection, article style & structure and article submission were also discussed and then the panel held a brief Q&A session. In addition the Publishers were joined by Professor Jamie Warner, the Editor-in-Chief of Materials Today Advances, one of the newly launched OA titles, Materials Today Bio and Results in Materials were also recently launched. We would like to thank the attendees for the valuable discussion as well as Xingcai Zhang and Marina DiDonato McLaughlin for their help in organising and advertising this event. A new algorithm for predicting exotic materials helped to reduce the time needed to develop a thermoelectric material from 15 years to 15 months.